TRAXALL 500 can track industry-standard 22Hz transmitters with signal strength represented as scrolling rows of LEDs. This intuitive user interface means that the TRAXALL 500 receiver requires almost no training or support, lowering the total cost of ownership of the system. The TRAXALL 500 and TRAXALL 501 receivers differ in their ability to support add-on accessories. 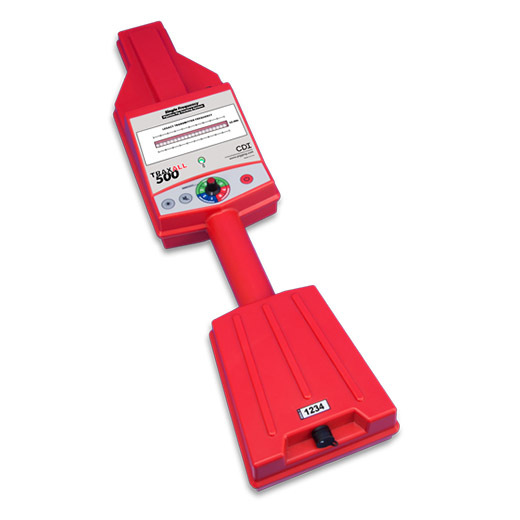 The TRAXALL 501 system supports the use of remote electromagnetic antennas and signal flashers with two external connectors while the 500 system does not. TRAXALL 500 is CDI’s lowest-cost receiver. One of the biggest goals for the TRAXALL 500 was to deliver world-class pig tracking at a globally competitive price. Budgets are always tight, but CDI wants to ensure that you don’t have to sacrifice quality to make your budgetary goals. Anyone who has experience with tracking using any of CDI’s systems or one of our competitor’s systems has nothing to learn. It’s that easy. A single knob adjusts the reception sensitivity of transmitter inputs, while the strength of the transmitter is intuitively indicated by a horizontal row of LEDs. The only other controls are a button controlling LED brightness and a button for audio mute. That’s it! The TRAXALL 500 receiver encapsulates virtually the entire product manual in the label for the Sensitivity knob (shown right). Eight sensitivity settings are neatly divided and labeled with their recommended use: PINPOINTING (low sensitivity), WALKING (medium sensitivity), and STATIONARY (high sensitivity). The TRAXALL 500 was designed with extreme conditions in mind. The system is fully functional from +85 degrees to -40 degrees Celsius limited only by the chemistry of the installed batteries. For extreme cold environments, the TRAXALL 500 may be ordered in a cold-weather lithium battery configuration allowing full tracking to a blistering -40 degrees Celsius. 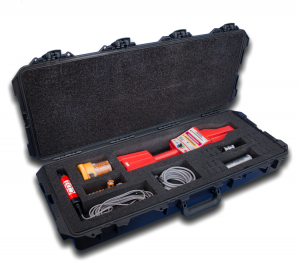 Despite being a low-cost receiver system, the TRAXALL 500 still comes shipped in our extremely high quality Pelican brand shipping/carrying case. CDI has developed a very large variety of transmitters of various sizes (including ATEX certified versions) to work with our entire lineup of TRAXALL receivers. These transmitters are user-programmable to operate at industry-standard 22Hz or TRAXALL-specific frequencies.